American rabbi and author; born Nov. 15, 1816, at Krotoschin; died May 11, 1886, at Newark, N. J.; studied theology, philosophy, and philology at the universities of Berlin, Breslau, and Prague. In consequence of giving public expression to his too liberal views, in poems and articles, he was compelled to leave Germany, and after staying for a short time in London he went to the United States (New York, 1849).Kalisch occupied rabbinates at Cleveland, Ohio (Tifereth Israel); Cincinnati, Ohio (Ahabath Achim); Milwaukee, Wis. (B'ne Jeshurun); Indianapolis, Ind. ; Leavenworth, Kansas; Detroit, Mich. (Beth El); Newark, N. J. (B'nai Abraham); and Nashville, Tenn. (Ohavai Shalom). He lectured frequently, especially after 1875, when he had retired from the ministry. He wrote a number of essays, monographs, discourses, and disquisitions. In Leeser's "Occident" (1851-52) he published a series of "Exegetical Lectures on the Bible"; in the Cincinnati "Israelite" (1854-55), "Contributions to Philosophical Literature." 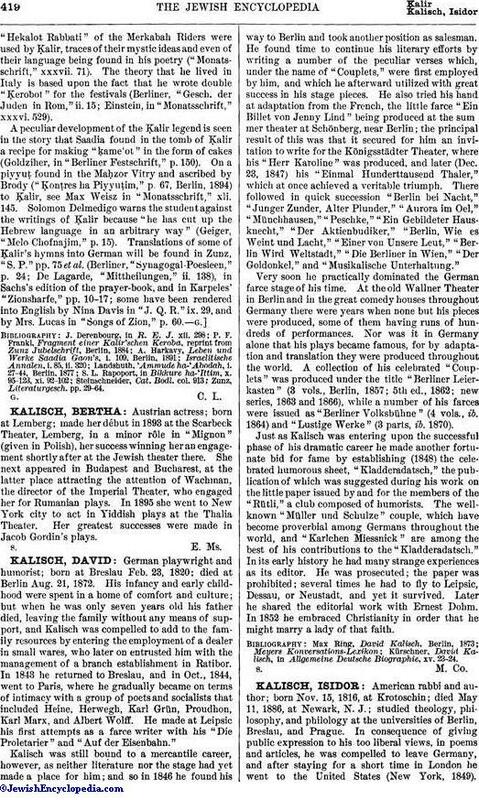 The London "Jewish Chronicle," the "Jüdisches Literatur-Blatt" of Magdeburg, the Vienna monthly "Beth Talmud," and other periodicals, published articles from his pen. 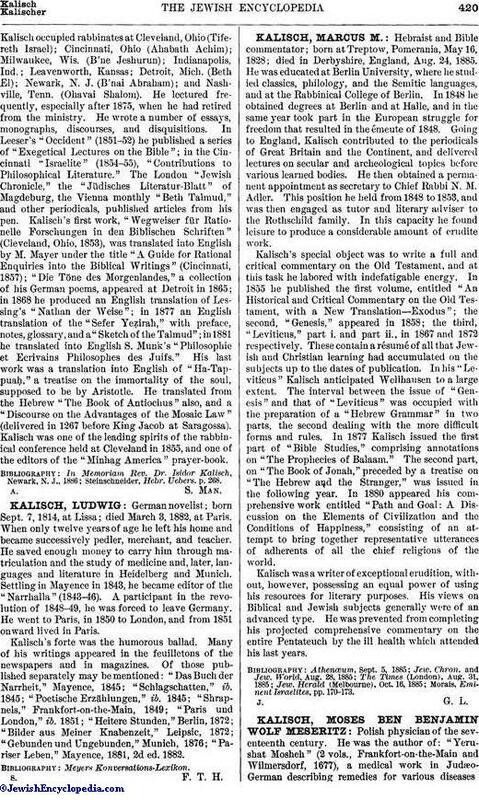 Kalisch's first work, "Wegweiser für Rationelle Forschungen in den Biblischen Schriften" (Cleveland, Ohio, 1853), was translated into English by M. Mayer under the title "A Guide for Rational Enquiries into the Biblical Writings" (Cincinnati, 1857); "Die Töne des Morgenlandes," a collection of his German poems, appeared at Detroit in 1865; in 1868 he produced an English translation of Lessing's "Nathan der Weise"; in 1877 an English translation of the "Sefer Yeẓirah," with preface, notes, glossary, and a "Sketch of the Talmud"; in 1881 he translated into English S. Munk's "Philosophie et Ecrivains Philosophes des Juifs." His last work was a translation into English of "Ha-Tappuaḥ," a treatise on the immortality of the soul, supposed to be by Aristotle. He translated from the Hebrew "The Book of Antiochus" also, and a "Discourse on the Advantages of the Mosaic Law" (delivered in 1267 before King Jacob at Saragossa). Kalisch was one of the leading spirits of the rabbinical conference held at Cleveland in 1855, and one of the editors of the "Minhag America" prayer-book. Steinschneider, Hebr. Uebers. p. 268.